CLARKSTON, Wash. — Washington winemaker Rick Wasem educates Basalt Cellars customers on the science behind colloids, tartaric acid and toast levels, and recently he’s achieved success with an oak experiment featuring some of the oldest Cabernet Sauvignon vines in the state. It’s also a study in education for consumers and marketplace research for Wasem. 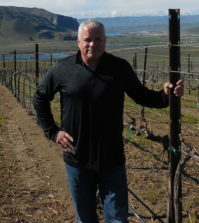 Essentially, the project for the Clarkston vintner has entered in its fifth year, and it continues to evolve as the Basalt Cellars 2011 Bacchus Vineyard Cabernet Sauvignon Oak Trial Trio. 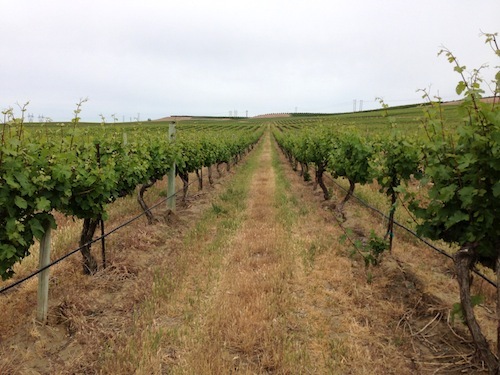 Bacchus Vineyard ranks among the state’s most venerable sites, first planted in 1972 at the suggestion of Washington State University researcher Walter Clore as part of the Sagemoor Vineyards project. Wasem took the cool-vintage fruit and applied identical winemaking methods to each of the three lots. The only difference, he said, were the barrels. One lot was made with a barrel of 100 percent new French oak — Seguin Moreau cooperage with a toast level of medium-plus and toasted heads. Another lot was aged in 100 percent new American oak — a Seguin Moreau barrel with a toast level of medium and toasted heads. The third also was produced by Seguin Moreau but with 100 percent neutral oak. Adam Schulz, Seguin Moreau’s sales territory manager for the Pacific Northwest, sells to more than 300 customers in Washington, Oregon, Idaho and British Columbia. The commercial offering by Basalt Cellars is something one might expect to experience in California’s tony Napa Valley, not a historic mill town along the Washington-Idaho border. “I’ve heard of one winery in Napa — Del Dotto — that offers something similar where customers have the opportunity to taste from different barrels and levels of toast,” Schulz said. 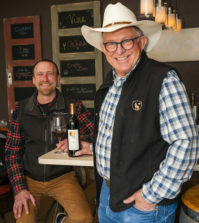 Wasem, who began in 1996 to establish his own small vineyard in the proposed Lewis-Clark Valley AVA, operates two business in the historic river town of Clarkston. There’s the winery, which he launched in 2004 with co-owner/co-winemaker Lynn DeVleming, but his family name is more closely tied to Wasem’s — the corner drug store founded by his parents. It offers a step back in time because the store at the intersection of Sixth and Oak includes a range of departments as well as a coffee shop proud of its fresh-baked pies and caramel corn. The combination can prove too tempting, especially for those with an empty stomach. The interest in various levels of toast for these tasty oak-trial Cabs from Bacchus Vineyard has inspired Wasem to venture into new experiments for customers from his 2,000-case annual production. 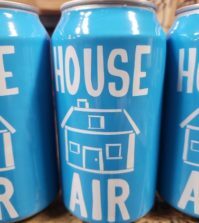 He chose to offer most of the Oak Trial Trio in 375-milliliter bottles, and sales associates Holly Bonnalie and Leisha Evangelho nearly have sold through with the 550 three-bottle gift boxes ($55), Wasem said. 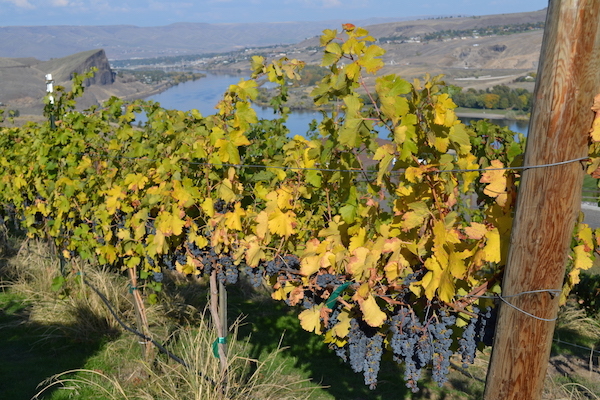 The winemaking style for Basalt Cellars reds is unfined and unfiltered, so customers are told expect to find a bit of settlement in the glass — and why. 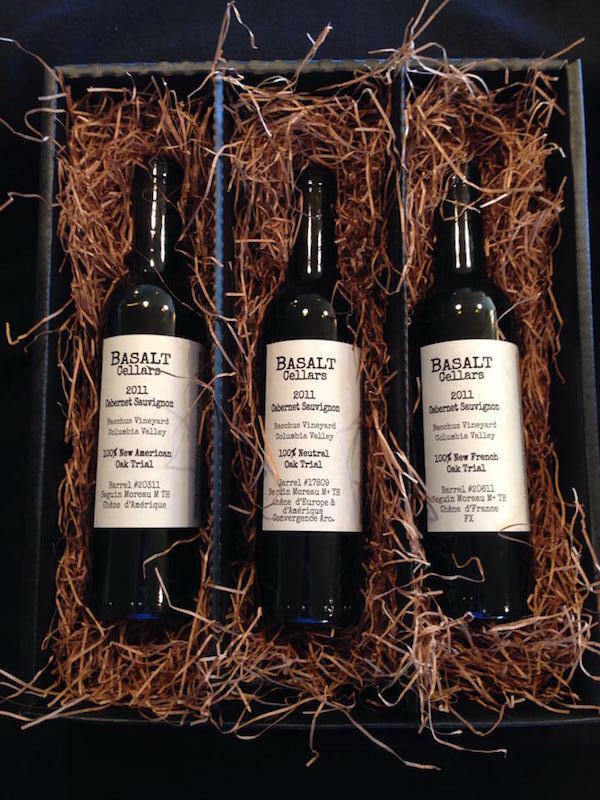 The small formats accelerate the aging process, but Basalt Cellars also set aside a small number of standard-sized bottles as a trio for $99. One experiment that holds particular interest for Wasem is his 2014 lot of Bacchus Vineyard Cab that’s resting in his new Micro Vinificator. 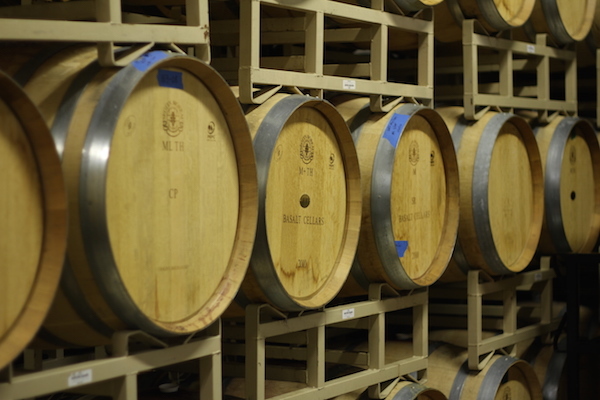 The Seguin Moreau product allows wine to ferment in an oak barrel that the winemaker rotates on a stand. Its design is intended to offer more gentle winemaking, in part because stainless-steel vanes work to wet the cap with reduced impact on the berries. The rotating fermenter also advances the development of wine, allowing a winemaker to release it to the market more quickly if they choose, Schulz said. A new 600-liter micro vinificator can run beyond $3,500. A standard-sized, 225-liter barrel with new French oak — such as the one he used for the Oak Trial Trio — can cost well over $1,000. Great Northwest Wine’s tasting panel recently evaluated and rated the Basalt Cellars oak trial series under single-blind conditions, side-by-side within a flight of other Cabernet Sauvignon from the Pacific Northwest. 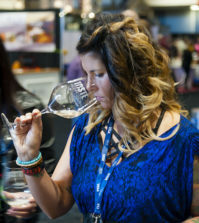 The wines were sampled in the following order, and panelists were not informed of the trial wines until after the flight. Barrel notes of roasted coffee, toast and vanilla extract lead the aromas, which also offers up hints of chocolate-covered blueberry, blackberry and pencil shavings. The flavors again feature smooth blueberry and elderberry along with cordial cherry and dusty tannins as vanilla bourbon and chocolate linger in the finish. Elegance of French oak shows up early and often, starting with the nose of French vanilla, blackberry, cola nut, dark toast, bittersweet chocolate, black licorice and Italian herbs. Black currant and juicy blueberry flavors swirl nicely among sandy tannins, pomegranate acidity and a finish of dark chocolate. Its delicious balance swings evenly with skilled tannin management, opulent oak and a reduced perception of alcohol.